Part husky & part wolf, Balto doesn't know where he belongs. He's an outcast in Alaska, except to his true friends. Boris, the Russian snow goose; polar bear cubs Muk and Luk; and the beautiful husky, Jenna. One day, a serious illness spreads among the children of Nome and when a team of sled dogs racing six-hundred miles through the fierce blizzard to bring medicine get lost, only Balto can rescue the team and save the children. Balto ..
Balto: Balto ia a dazzling, animated adventure about one of the most courageous canines of all time. Based on a true story, Balto will touch your heart. Part husky/part wolf, Balto doesn't know where he belongs. He's an outcast in Alaska, except to his true friends - Boris, the Russian snow goose; polar bear cubs Muk and Luk; and the beautiful husky, Jenna. Even though he's different, all of Balto's friends recognise what he still can't..
Balto: Amblin Entertainment presents a dazzling, animated adventure about one of the most courageous canines of all time! Based on a true story, Balto will touch your heart. Part husky/part wolf, Balto doesn't know where he belongs. He's an outcast in Alaska, except to his true friends. Boris, the Russian snow goose; polar bear cubs Muk and Luk; and the beautiful husky, Jenna. Even though he's different, all of Balto's friends recognise..
Balto captured the worlds imagination. Now the adventure continues, and this time Balto is not alone... Balto becomes a father and all the pups but one, Aleu, are given away to good homes. However, the young Aleu discovers that she will never be accepted like her brothers and sisters because she looks more wolf like than dog. Upset, she runs away to begin her quest for the meaning of life and to find her true place in the world. A worri.. Your favourite is back in an all-new adventure! 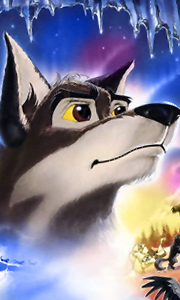 Balto and his son Kodi (voiced by Sean Astin, Lord of the Rings), find that technology is threatening the sled dog team's future, as the airplane becomes a faster choice for bringing mail and supplies to Nome. Amidst the controversy, a race to deliver the mail is arranged between a sled team led by Balto and a bush pilot who flies a plane that truly fascinates Balto. When Duke, the pilot, ..